Hand-crafted in the United States, Fire Pit Art fire pits are constructed with durability and creativity in mind. 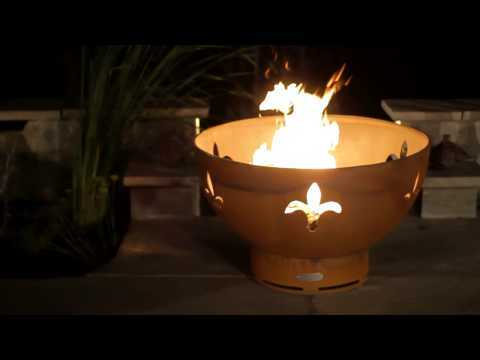 The Fleur de Lis fire pit is three feet wide at the top for a large viewing area from any angle or height. The bowl features a fleur de lis design around the sides and is constructed from heavy duty 1/4-inch thick carbon steel to make it one of the most durable steel fire pits on the market. The inner bowl is coated with a paint that is resistant to high temperatures, while the outer side has a maintenance-free, iron oxide patina that will darken over time. A drain in the middle allows rain to escape to prevent rusting. Each fire pit is unique and is individually numbered by the artist on a brass plaque, so you know you are getting a one-of-a-kind piece. All components are warranted for a period of 10 years after date of purchase by the original owner against defects in materials and workmanship under normal use. I actually bought this fire pit after seeing one at a Home and Garden Show. Since then, I have purchased one for my parents-- with no regrets. Very high quality. Each piece has its own character and will be in our family for many years to come. Definitely a memorable gift for yourself or someone you love.